Summary A two-day conference – Shale UK – was held in early March 2014 in London, and attended by over 250 delegates. The conference, organised on behalf of the Geological Society by Global Event Partners, was designed ‘...to present an authoritative state-of-the-art view of geoscience relevant to shale gas exploration, production and environmental management in the UK. It aims to bring together the leading experts in relevant areas of geology, from the UK, US and elsewhere, with decision-makers, potential investors, others in the hydrocarbons and energy supply chain, and other stakeholders with an interest in shale gas.’ The aims of the conference organisers were fully met in a comprehensive programme of 26 presentations and ensuing discussions, which ranged from fundamental aspects of the geology of organic-rich mudrocks to the impact of EU regulations on UK shale gas activity. 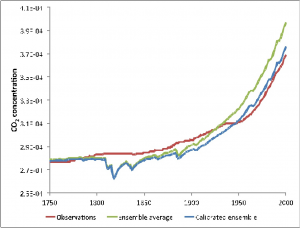 Aspects of the massive shale gas expansion in North America of the last seven years featured frequently in some presentations, whilst the similarities and differences between the North American and European/Asian situations were used to highlight how shale gas exploitation might, or might not, develop in the UK. Introduction Shale gas and oil are hydrocarbons that never escaped from their source rocks (organic-rich mudrocks), because the source rocks were insufficiently permeable for hydrocarbon migration. 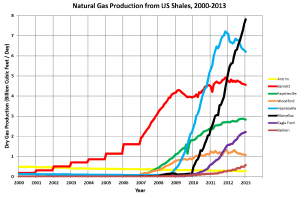 Although relatively small amounts of shale gas have been produced for over 30 years, it is the development within the last decade of new techniques such as horizontal drilling and hydraulic fracturing that have given rise to the recent North American shale gas bonanza. 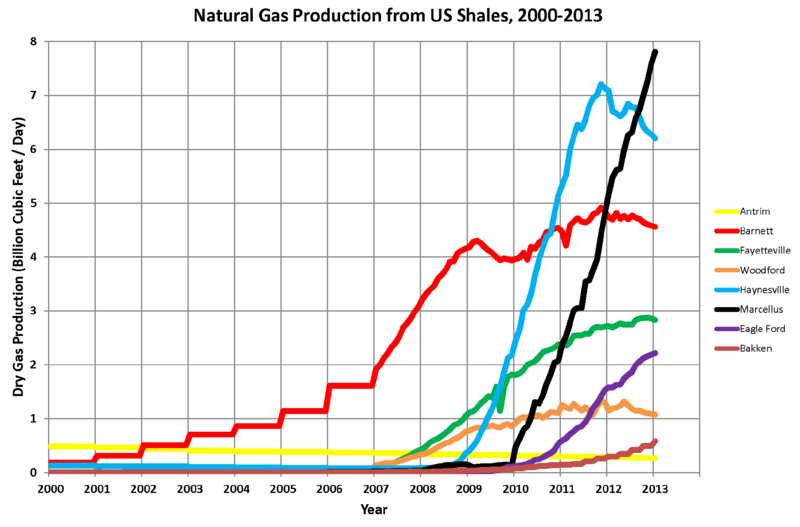 The rise in US shale gas production since 2007 is shown in Fig. 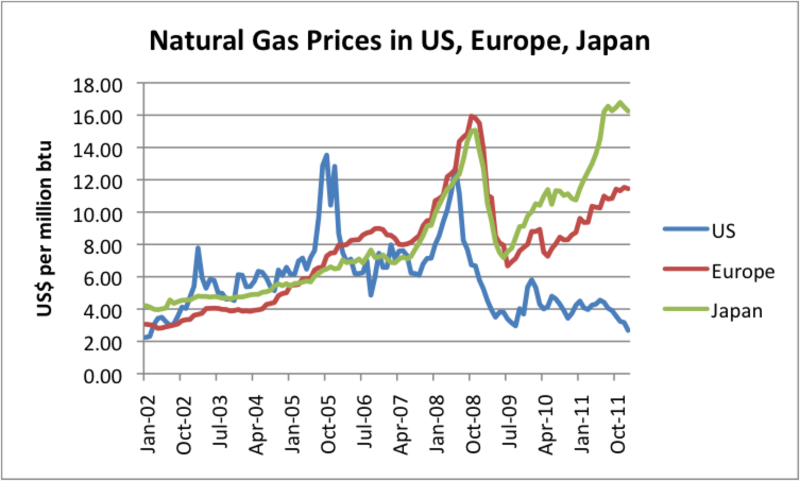 1, which breaks down gas production according to the major gas fields, whilst the contrasting prices of gas in the US, Europe and Japan are shown in Fig. 2. - A relatively low population density coupled with extensive suitable lithologies in sparsely populated regions. - Landowners who are willing to allow shale gas exploitation. - A substantial, highly motivated and experienced drilling industry. - An existing, extensive national gas pipeline. 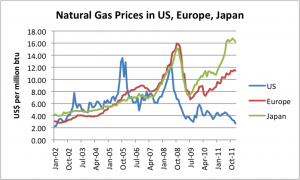 - Limited and expensive opportunities to export gas from the US at present. 1. The location of suitable gas-bearing lithologies: The UK’s shale gas potential is mostly based on the Carboniferous-age rocks of the Midlands and northern England, and the Jurassic rocks of southern England. These successions underlie large centres of population. 2. The relatively complex geological framework of the lithologies that varies on a small scale. 3. 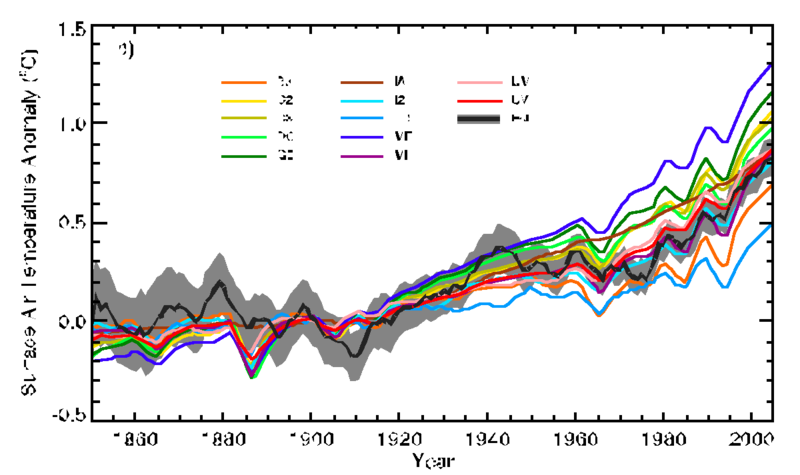 The relatively short life span of wells; 3 years sees a fall of 85% in gas production. 4. Legal and regulatory framework; a comprehensive regulatory framework already exists, although it is complex. Permissions are required from the Local Authority, the Department of Energy and Climate Change, the Environment Agency and the Health and Safety Executive. - The high density of wells that is required for gas production. - The substantial infrastructure that is needed to produce and maintain the wells, using space and causing noise. - Possible microseismicity related to hydraulic fracturing (‘fracking’). - The production and handling of large volumes of well waters that are radioactive. - The potential contamination of aquifers and surface waters from well waters and drilling compounds. - The production of shale gas requires much more energy than conventional natural gas; it thus has a much greater carbon footprint. PRG members and UK organic-rich mudrocks (‘shales’) Three members of the Palaeoenvironmental Research Group have long-standing interests in the geochemistry, stratigraphy, sedimentology and palaeontology of organic-rich mudrocks of the UK and elsewhere. 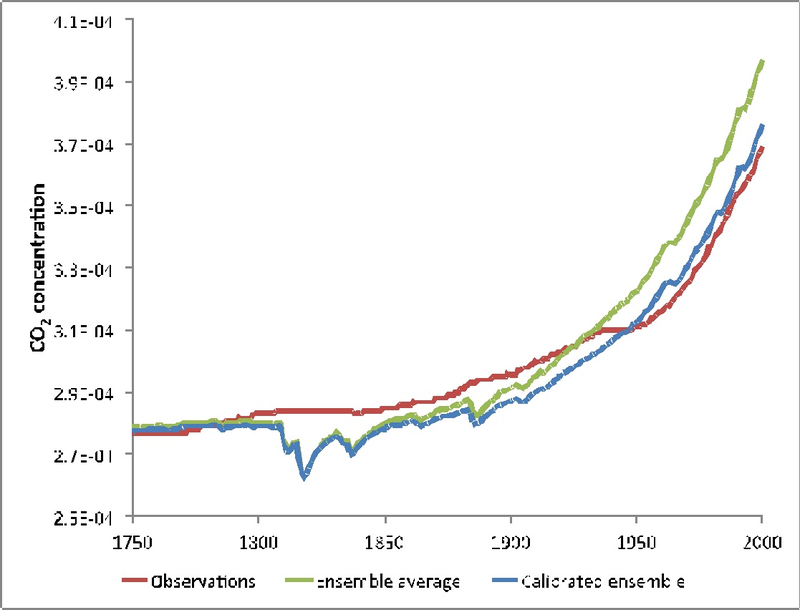 Anthony Cohen, Angela Coe and David Kemp (recently joined by Marie-Laure Bagard) have developed new methods for extracting a range of geochemical and palaeoenvironmental information from important Mesozoic and Cenozoic organic-rich mudrock successions. 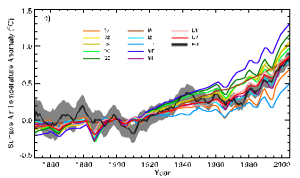 These methods have provided us with detailed information about the timing and extent of some key environmental changes in Earth history (including seawater oxygen levels, continental weathering rates, and associated changes in marine biota) set within accurately defined chronological frameworks.